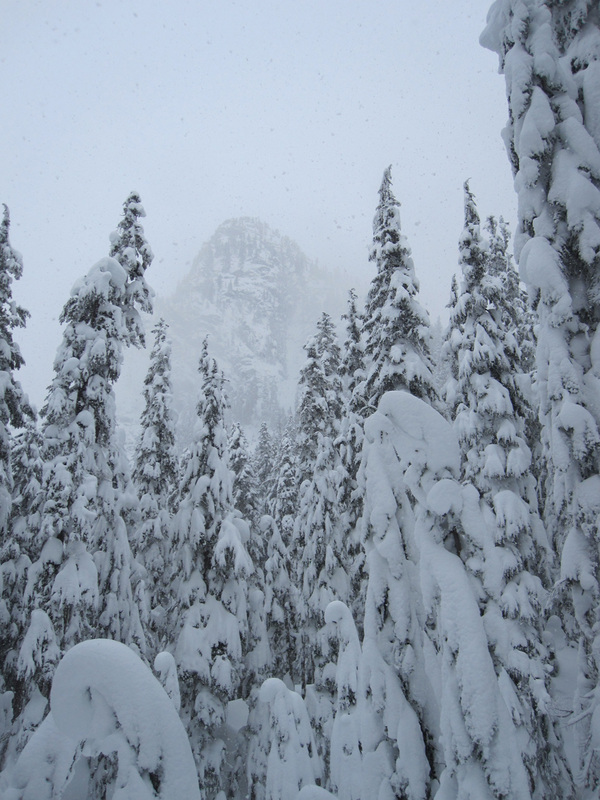 Snowshoeing on the Cascade crest today with other naturalists…cold dry snow and low clouds. Crystal filaments of hoar frost cling to the green tree needles. Conifer limbs flex and bend under the weight of snow, creating cones and umbrellas and other shapes that have no names. Light showers of fine snow sift down during the day, dusting hats and hoods and packs. It’s so enchanting to be out, to feel the mountains more than see them. To walk among the old hemlocks and firs, watch for animals tracks and lichens, and share curiosity with like-minded souls. We have the best snow right now that I have seen in years. So dry and soft, it make for a good workout and no crunching of snowshoes on ice. I’ve been out everyday since Dec. 22, many at night after work. Night shoeing is fabulous, with the full moon after Christmas and owls in the neighborhood. I feel for the trees, shouldering the burden of all that beauty. Feels like I’m right there with you. Do so appreciate adventuring with you. Bliss. Glad to have you along, Andrea. I stopped several times yesterday to savor feeling completely happy. Bliss, indeed.